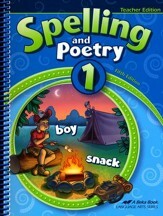 Spelling and Poetry 1 features 30 spelling lists that contain carefully selected phonics-based word lists. 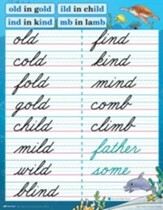 Each spelling list has an information box above each spelling list that emphasizes a phonics rule or special sound; each list is followed by three or four fun exercises that include matching, fill in the blank, editing, and multiple choice exercises to help children learn to memorize and spell correctly. This workbook also includes advanced/sight words marked in green, review lists, and age-appropriate poems to help develop a love for poetry and strengthening memorization abilities. The back section of the book entitled "Homework," features each spelling list and a detachable portion with blanks to copy the corresponding spelling words. Great for review purposes, the homework features each word in cursive and in print for recognition of both styles of writing. 132 pages, softcover. Grade 1. 5th Edition. 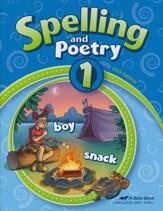 This teacher's edition is designed to be used with the Spelling and Poetry 1, 5th Edition student text. This resource includes the child's text with the answers overlaid and also presents teaching tips in bright blue font throughout. The extra copy of the homework pages can provide you with extra practice for your child whenever needed. Word Mastery tips and Enrichment Ideas are included in selected lists to make your instruction as effective as possible and to give ideas for optional activities. Extra teaching notes and a Sentence Bank for each list are also included in the back. 152 pages, spiralbound. 8.5" x 11". 5th Edition. First-graders can learn to read and spell at the same time! In fact, spelling is an important part of phonics class. Spelling 1 Charts, Cursive Edition has colorful charts, large enough for whole-class viewing (17.5" x 22.5"), have all 30 grade 1 spelling lists. 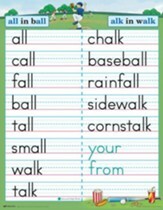 They are used for class teaching and for copying spelling words during seatwork time. For your convenience, each chart is labeled with the identifying spelling list number as well as the lesson number in which the chart is introduced in phonics class. Each chart is written in cursive just as the words should look when copied on the student's writing tablet. Includes 15 attractively illustrated charts printed front/back for a total of 30 charts. 30 pages. Grade 1. Spelling is an important part of phonics class, and it helps to keep spelling words constantly visible while they're being learned. These colorful charts, large enough for whole-class viewing (17.5" x 22.5"), have all 30 Abeka grade 1 spelling lists. They can be used for teaching co-ops or classes and for copying spelling words; each chart is written in manuscript just as the words should look when copied on the student's writing tablet. Each chart is labeled with the identifying spelling list number as well as the lesson number in which the chart is introduced in phonics class. Includes 15 illustrated charts printed front/back for a total of 30 charts. 17.5" x 22.5". Grade 1.